My family is really into... NO, let me be brutilly honest... We ARE OBSESSED with Harry Potter. We own all the books, including the extra books JK Rowling wrote about Fantastic Beasts, Magical Monsters, Quiddich Through The Ages, The History of Magic and an unofficial Harry Potter cookbook, too. Plus we've watch ALL the movies several times. Plus, the new Fantastic Beasts and Where to Find Them movies. So, of course I had to throw a Harry Potter themed birthday as my youngest who turns 11 this month. And it all kicks off with the letter. According to the books, at age 11 every child that holds magical abilities is accepted into Hogwarts School of Witchcraft and Wizardry. 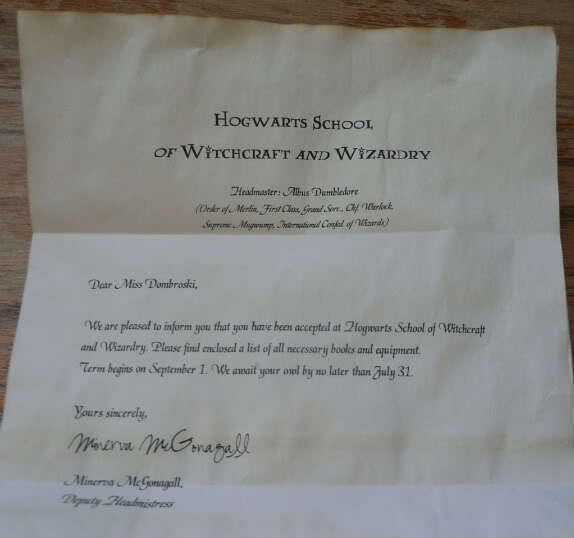 In this case we used the acceptance letter as invitation to our party written with the authentic fonts from the first book. Get Harry Potter style fonts here. Directions on how to create your own letter here. Follow the directions and voila!! You are the coolest in the land! Our party's setting is at Hogwarts School, so according to the books, you must got through a brick wall at the train station to Platform 9 3/4. Only witches and wizards know about this secret entrance. There young students hop on the Hogwarts Express to get to the school. So creating an entrance like the book's description is a must! You can place it over a doorway or hall entrance and have your party guests run through it (like in the book). You can easily make this brick wall entrance to the Hogwarts Express with stuff you have around your house. Lightly blend the paints together on a plate. But don't mix them. It really doesn't matter how much of each color you use, just have fun with it. Use an old rag to blotch the colors on your sheet. Then smear all over any way you want. Just cover the sheet. Then take your paint brush with black paint and make off set lines for the bricks. This doesn't have to be perfect. The imperfections give it a distressed look. Now you need the Hogwarts Express sign. That's easy...just download the PDF I made HERE and enjoy!